I haven't been cooking or baking these few days. Partly because I have been out shopping and spending time with family members. All the wonderful stuff right? hehehe... actually I don't really enjoy shopping. I shop for necessity these days. The house modem suddenly broke down. You know how it is like without internet when we are so used to it. So this item was not something that we can procrastinate. Bought a booster but I am now having a hard time getting it to be connected! But at least the internet is now working. I took the opportunity also to get some clothing for the kids especially the warm ones as they had long outgrown them. With the exam getting near, I thought this might be a better time to do some shopping (a way to distress) rather than later as I will be scrambling to get the house neat and tidy and all bills paid off before we head off. Now let's talk about food. While at the mall, after dinner with my parents and sister, we past by a bakery that was famous for their Cream Cheese Bun. Since there wasn't a queue and the tray was just fresh out from the oven, we took the opportunity and bought a few. My daughter was really cute. She was eagerly waiting for the bun to cool down so that she can eat it. Before she took a bite, she makes a comment: "Mom, what happened to the bun? What it is so small now?" We had a good laugh over her comments. She just loves to eat. Anyway, I tasted one this morning, and straight way I didn't like it. I could taste cheap mayo in it! Thus I decided to bake my own! My trial wasn’t a smooth one. Cooking the Tang Zhong was not a problem, forgetting to put it into the main dough was! You see, I panicked after seeing how dry my dough, quickly text my dear friend W who is an expert in baking. While waiting for her to respond, I played the Smart Alec and added milk. Only when I added in did I realised that I actually forgotten my Tang Zhong. Hahaa no wonder it was dry! Damaged done, and I didn’t want to throw away the dough as it was a double batch. So I added in more flour to make it manageable. The dough raise beautifully and boy am I pleased. Getting the cream cheese wrapped was not an issue as I have chilled it so it was not too soft to handle. After the final proofing, the cheese actually leaked. Not all though but some. Guess I didn’t close the dough properly. Using 190ºC, I am not use whether it is too hot for the buns as it browns quickly @ 8 mins. I flipped the buns over and put on another baking tray on it, compressing it a little. Still my buns didn’t turn out flat like those in the bakery, perhaps I should use more pressure but yet I was afraid the cheese will leak even more. Note: I need to add in approx 3 tsp of cream cheese in order to see more cheese fillings. Verdict: Overall, I won’t rate my experience as successful but definitely it didn’t get a F for it. Because of my past experience with Tang Zhong, I believe the fault lies in me with this recipe. Bye bye cream cheese that tasted like cheap mayo! In a mixing bowl mix the flour and water over low fire, keep stirring until it reach 65°C then switch it off. Use plastic wrap to cover the dough to prevent the top layer dry up and let it cool down before use. Put all the ingredients in a mixing bowl except salt and butter and mix well. Mix to a dough then add in salt and butter and knead to a soft dough. Take out the dough and shape it round and cover a plastic wrap and let it proof for the 1st time to double in size. When the dough has proof to double in size divide the dough to 60g each and shape with some raisin into a round shape and proof for the 2nd time for another 15mins 20mins. Flatten the dough and wrap with cheese filling, put on the baking tray and let it proof for the last time to double size. Bake at 190°C for 10mins then turn over the bread to the other side and place a tray on top of the bread and bake for another 10mins. Beat cream cheese and icing sugar together till it is smooth. 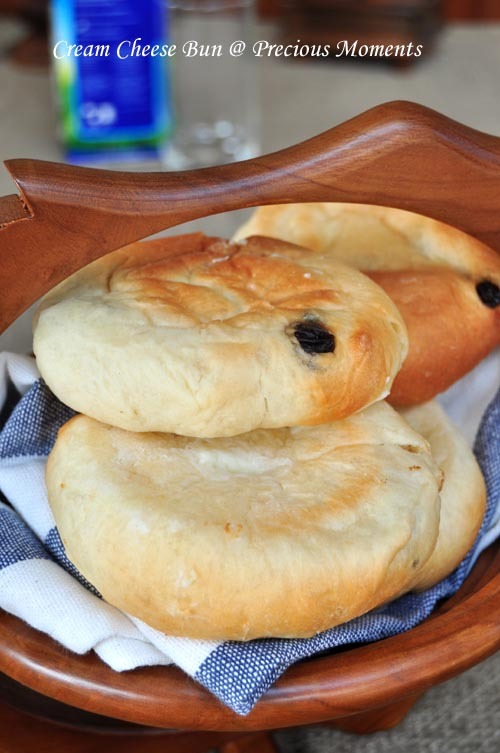 Home baked buns are always the best. I was lucky that this batch didn't turn out rock hard. In fact, it is soft. 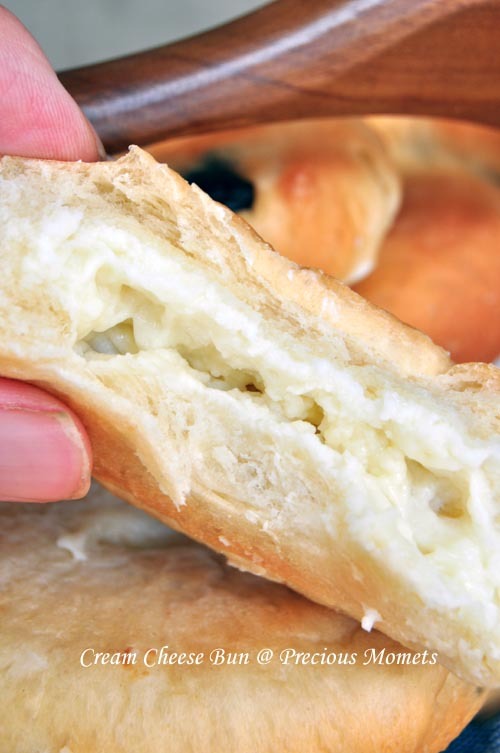 I love barcook cream cheese bun, yours looks very nice! Jess, I tasted mayo in theirs. Perhaps I don't like mayo thus I was not impressed. Edith, your buns look pretty good. Home made is always the best! Yes, at least we know what went inside. Gosh, I can't imagine life w/o internet! Lol! I love cream cheese & u got me sold on this one. Wish I could have a bite now! Hahaha!